Marvel Legends Fantastic Four unboxing (with Galactus!) and review – AiPT! Unboxing Marvel Legends Thing, Human Torch, Invisible Woman, Mr. Fantastic, and Silver Surfer. It has been long overdue, but Marvel Legends has finally satiated fans with a full lineup of Fantastic Four figures. Human Torch, Invisible Woman, Mr. Fantastic, and now the Thing are all available via Walgreens exclusives. Silver Surfer is also available hitting the market just a few months ago. The last of the figures to make it into the bunch was Thing which is still only now popping up in stores. Holding off all unboxings until the entire first family was complete Lisa and I unbox all five figures who are welcomed by a certain purple villain. As you can see these figures rule! They certainly left the best for last with Thing who is an extra large figure (with a good weight to him) and incredible detail in all his stony bits. It’s a nice touch that he comes with two heads and I can’t wait to pose this figure fighting the Hulk soon. Mr. Fantastic might be the second most impressive figure due to his bendable arms. The arms don’t bend too easily, but they can get there with enough patience and force. Human Torch is also a great figure with a translucent look to his flame body and nice detailed flames on the head and legs. Silver Surfer is also quite nice with an impressive board and a great paint job from his silvery self to the black around his eyes. Rounding out this crew is Invisible Woman who is, well, just alright. There aren’t much invisible effects aside from her hands and a bit of her arm. She does come with H.E.R.B.I.E. but he’s cartoonish and a bit dweeby. An additional invisible woman shield would have put her over the top. Also in this video is the SDCC 2010 exclusive Galactus who is not easily found, but quite impressive. 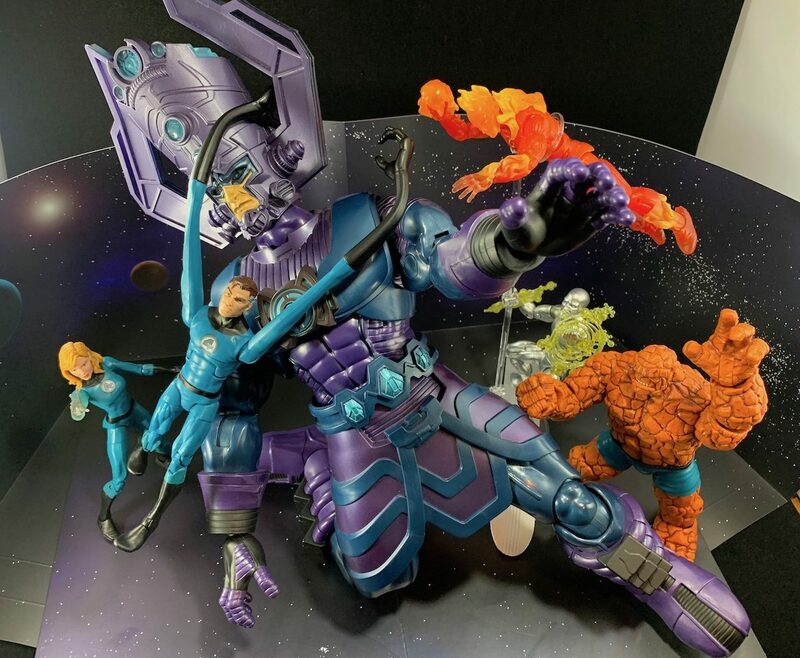 I do wonder if a new giant Galactus may pop up soon given the entire Fantastic Four is finally emblazoned in Marvel Legends plastic, but only time will tell. What did you think, did you like this unboxing? Will you be getting the entire set of figures? Let us know in the comments. A solid lineup that finally feels complete. Now just a few villains and (maybe) a new Galactus and we'll be right as rain.